In Berlin Ed's voice slightly improved in comparison to previous shows, though still was hoarse. Audience was very enthusiastic, performing a lot of crowd surfing. 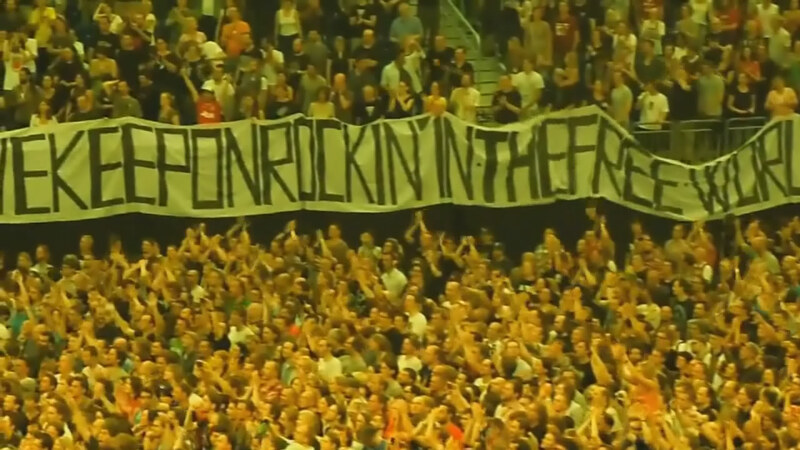 Near the end of "Jeremy" the gigantic banner 'We Keep On Rockin In The Free World With U' appeared on the right-side balcony, and Ed addressed it introducing Neil Young as a songwrighter for the band and saying that this was one of the biggest banners he had ever seen. 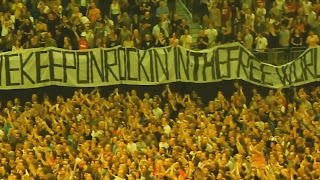 Ray Cameron (Matt's son) joined the band on the stage taking Mike's guitar (Mike armed himself with tambourine instead), while Stone broke into his firing solo for "Rockin' In The Free World". Before "Even Flow" Mike's mother came onto the stage, and the audience sang 'Happy Birthday' very loudly to honor her. This is an audience, youtube based (HD only), multi-camera edited video (with Vegas Pro 11 as 720p), s-board audio, 25 songs out of 28 included. Best picture quality option is HD video. Yes, thank you for letting me know! Fixing it.